To begin with, you need firstly make sure you have the below things prepared for Blu-ray backup. 1. A Blu-ray drive: The must-have thing you need to copy Blu-ray discs to hard drive or copy ISO image file onto a blank disc. There’re various Blu-ray drives available online. You could purchase one from Amazon or other online stores if you don’t have one. If you want to copy and backup ISO image file onto a blank Blu-ray disc, you need to get a BD-RE (Re-recordable) drive. 2. A Blu-ray backup tool: Currently no computer is preset with a Blu-ray drive and Blu-ray backup tool. That’s why you need a Blu-ray backup tool, just like the abovementioned Leawo Blu-ray Copy. It’s the simplest but most full-featured Blu-ray backup software app to backup Blu-ray to PC or blank disc. 3. Blu-ray movie source: Of course, you need to prepare the source Blu-ray movies for backup, a Blu-ray movie disc, Blu-ray movie folder, or even Blu-ray ISO image file. 4. Anyplace with at least 30G free space storage: Depending on what you’re about to get, you should make sure there’s enough space, either hard drive or blank disc. Blu-Rays are big in content storage. To get high quality backup of source Blu-ray movies, higher storage is required. You need to select a proper drive or prepare a big blank Blu-ray disc for saving the final backup, or make use of an external hard drive if your computer is running out of storage. 5. Internet connection: Make sure that your computer is well connected to the Internet as some Blu-ray discs are encrypted while you need to connect the Internet to remove Blu-ray disc protection and back up Blu-ray disc. * Movie-only backup, 1:1 disc duplication, etc. To copy Blu-ray discs or folders, make clear you’ve already got the abovementioned things ready on your computer. 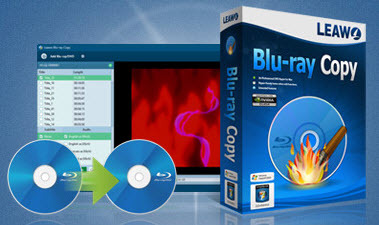 Download and install Leawo Blu-ray Copy on your computer. Kick off Leawo Blu-ray Copy and. There’re 3 ways for you to load source Blu-ray movies for backup: 1. On the main interface click the “Add Blu-ray/DVD” button to browse and add source Blu-ray movies for backup. 2. Directly drag and drop source Blu-ray folder/disc into this Blu-ray backup tool. 3. Click the inverted triangle drop-down button next to the “Add Blu-ray/DVD” button to import Blu-ray disc directly from BD drive. After adding source Blu-ray file, select a copy mode from the preset “Full Movie”, “Main Movie” and “Custom Mode” options, set output disc type at the bottom. Then, click the big green “Copy” button to call out a sidebar, on which you need to do more Blu-ray backup related settings: Copy to, Disc Label and Save to. Difference between the 3 copy modes: Full Movie mode would copy and back up all source Blu-ray file, Main Movie only copies and backs up the longest title in source Blu-ray file and allow you to select subtitle and audio track, while Custom Mode enables you to freely select specific title(s), subtitle and audio track for backup. Under the “Copy to” option, there are 3 options for you to choose. You need to choose at least one (3 for the most). To backup Blu-ray to Blu-ray disc, you need to insert a blank writable Blu-ray disc into the Blu-ray disc drive beforehand and then select the Blu-ray drive under the “Copy to” option. Finally, click the “Copy” button on the sidebar to copy Blu-ray to hard drive immediately. Leawo Blu-ray Copy would start to back up Blu-ray file as you’ve set. On the Copying window, you could view the copying progress and do after-copying settings.